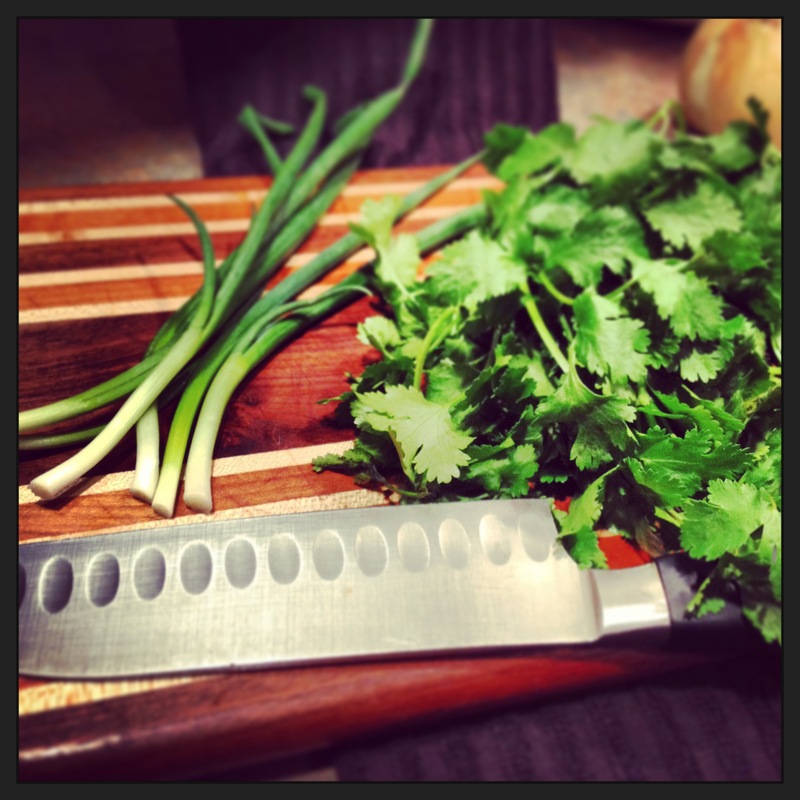 Mexican at home… easy peasy lemon squeezy. For some reason i have always felt i could not replicate the delicious tastes i encounter when eating out at a Mexican restaurant. i always felt that when i made it at home it was… good… but not WHOA good. it seemed to lack something each time. so being the food critic that i am, i decided to pay very close attention to the next dish served to me in some of our favorite Mexican joints in the Burgh. what i noticed was that each dish came out with plenty of fresh cilantro mixed on, and sometimes INTO the food. another thing that stood out were green onions. their flavor is so mild yet so fresh… one might miss their role in the dish unless you were really paying attention and looking for answers, as was i. i decided at that moment i would never again prepare Mexican food without those two ingredients. 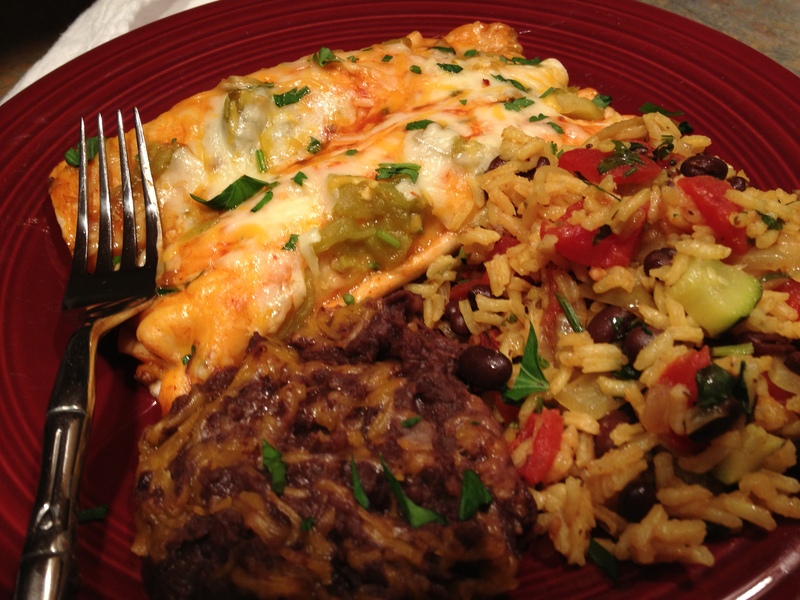 the Mexican dish i like to make most at home is the beef enchilada. when you start with fresh, lean beef… and add in amazing spices and fresh ingredients- it is transformed into a filling worthy of eating on it’s own. THAT, my friends is how you know your dish is going to be absolutely amazing at the end- when you can’t stop sneaking tastes of the filling itself! 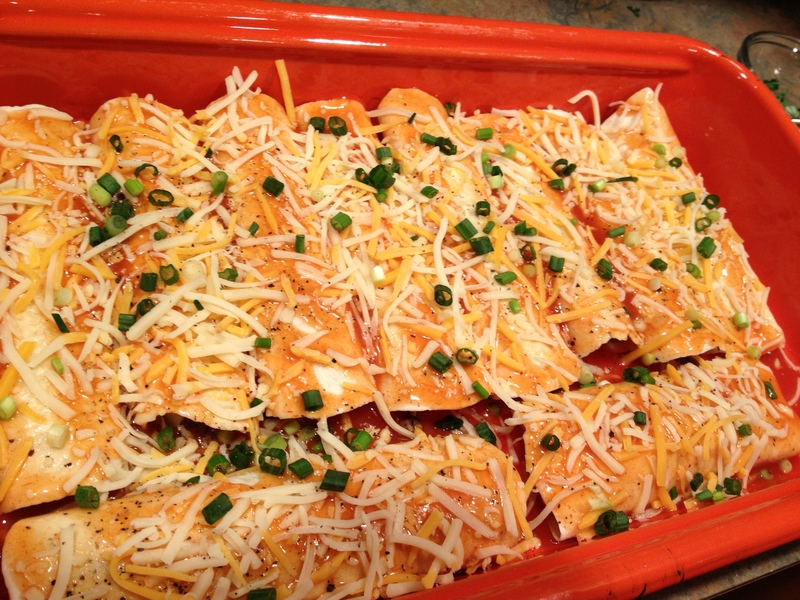 (i do the same thing with my stuffed italian shells when i prepare them with cream cheese vs. Ricotta.) and to think that you are about to fill some lovely soft fresh tortillas and coat with delicious sauce and plenty of cheese??? yup… they’re gonna smile. over medium high heat, add a few shakes of red pepper flakes. add in your onions and saute them for a few minutes. add the beef, and begin to break up and even it out in the pan. 1/2 t cumin; 1/2 t chili powder; 1/4 t black pepper; and a nice shake of coriander. keep working it around- once you don’t see any more pink- add you can of diced chiles. stir to combine. then stir in a 1/2 cup of shredded cheese, and lastly- about a Tablespoon of chopped fresh cilantro. once your rice is going- fill your tortillas. in a pyrex dish- coat bottom with a thin squiggle of olive oil (or wipe some on with a paper towel to coat) this helps the enchiladas to release nicely when you are serving. 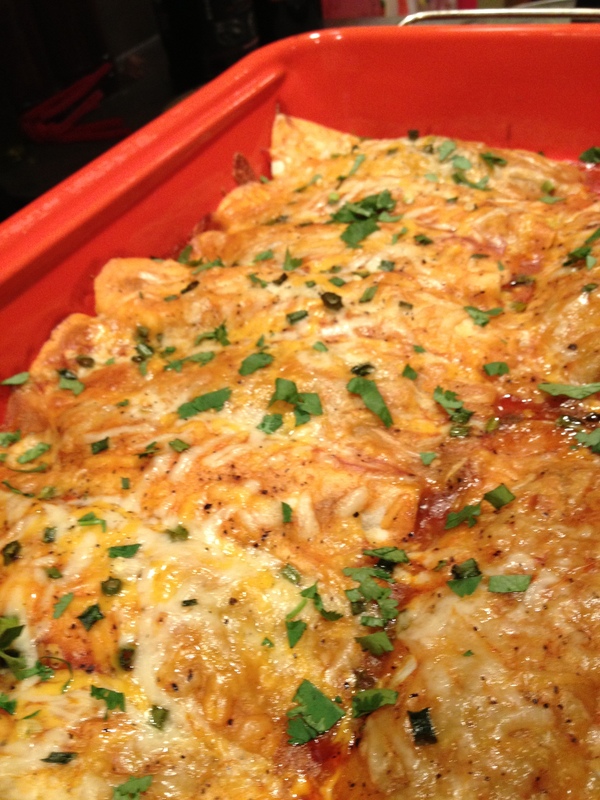 fill each enchilada with a bit of meat- (do not overfill) – if i had to guess i would say it was 1/4 cup. prepared pan- ready for the hotbox!! FINITO!! and smelling amazing, PS. once you take these out of the oven, go ahead and hit them up with a generous shower of chopped fresh cilantro. do it while the cheese is hot, as it will hold on the herbs nicely this way! i highly recommend allowing these to rest for ten minutes or so… if you try to take them from pan to plate immediately- you will have a mess. give them some time to ‘set’ a bit- and also this way your lovelies can dig right in without burning their mouths once you hand them their plate of goodness. 🙂 i love serving this with black refried beans- which i do serve from a can. i buy these in the mexican aisle of your better grocer- and always opt for organic if it’s an option. simply turn them out into a bowl, sprinkle about a 1/2 cup of shredded cheese atop, and microwave for about two minutes. stir lightly, and serve. if you have an aversion to refried beans… ( i used to, until i tried these.. and i absolutely love them now, PS) go ahead and serve with some fresh veggies or a simple salad, your call. –(i normally also add either a can of chick peas or black beans – drained and rinsed- but for this particular food pairing- if you are serving refried black beans- you may want to leave the beans out of this recipe) – if making this at other times however, just for a side dish… add a bean to the mix for sure. Heat 2Tablespoons of olive oil in a large non stick skillet. Add one large chopped onion. saute five to ten minutes stirring frequently and then add 1.5 cups of rice. stir in and saute a minute or two, allowing to heat up a bit. Add another tsp of olive oil, and then add your tomatoes and your can of chicken broth. (if using beans or chick peas, add them at this time- remember to drain and rinse first) add your spices, including a small handful of chopped cilantro. stir, and bring just up to bubbling and then COVER. reduce heat to simmer- and cook for 15 minutes. 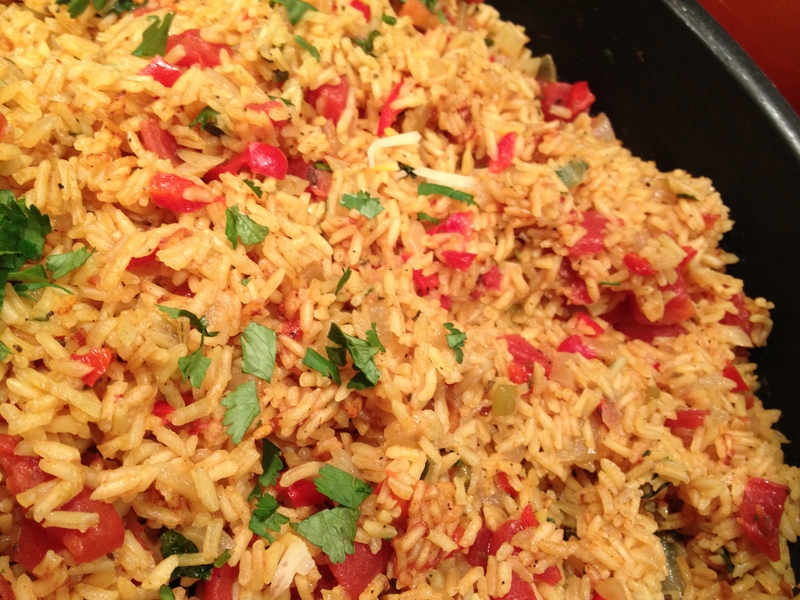 DO NOT STIR THE RICE AT ALL AS IT COOKS- THIS WILL RUIN IT AND MAKE IT A GUMMY MESS. trust me on the time- it’s 15 mins at a simmer. cut heat, remove lid and stir lightly- i tell people to take your spatula, and with the back side of the spatula, take and kind of push your rice around a bit, loosening it from the bottom. do not full on stir it up- again- you want it to stay light and fluffy. sprinkle with plenty of cilantro- and if you desire, move the rice to a nice serving bowl at this point- and even hit the top again with salt, pepper, and more cilantro. VOILA!! the perfect partner for the enchiladas above- or any main course for that matter. we prepare this rice frequently as a side in the summer months- adding fresh chopped zucchini at the end- or just as is alongside some grilled citrus chicken- or a nice steak kebab. i hope it becomes a go to recipe for many of you. Enjoy yo! !